BEIJING, 2 March 2018, (ADB News) — The Asian Development Bank (ADB) today signed a loan equivalent of up to $200 million to help China Water Affairs Group Limited (CWA) improve wastewater management and increase people’s access to clean and reliable water supply in the People’s Republic of China (PRC). 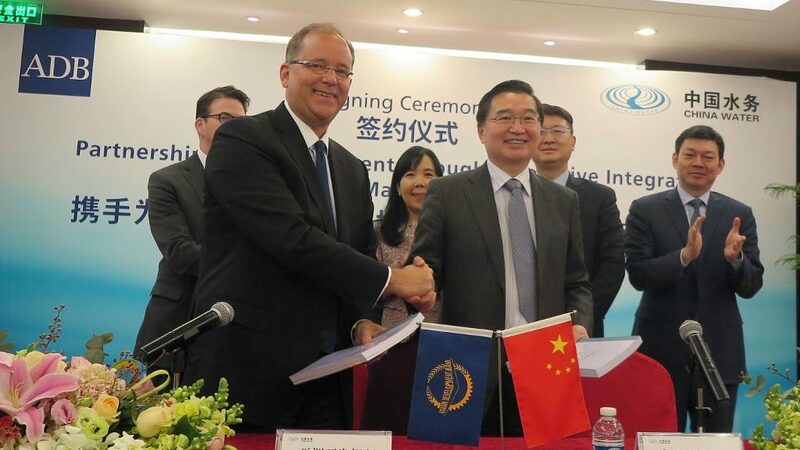 Christopher Thieme, Deputy Director General of ADB’s Private Sector Operations Department (left), and Duan Chuan Liang, CWA’s Chairman (right), during the signing ceremony in Beijing. This transaction builds on the success of ADB’s earlier partnerships with CWA, which focused on supplying water to cities and surrounding rural communities. In this new financing, the emphasis is on supporting CWA’s innovations to link the entire water value chain, including wastewater pipelines and treatment. CWA, established in 2003 as one of the first private companies to own and operate water distribution networks in the PRC, has concession operations in more than 50 cities, across 16 provinces and provincial-level municipalities, in the country. CWA’s main business lines include water supply, wastewater management, and water construction services.